I’m so excited to be part of a new Facebook group with ten fabulous authors, all of whom write emotional stories of love, family, and friendship. 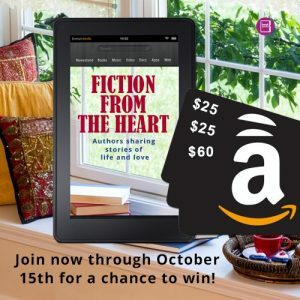 Fiction From The Heart is a vibrant and supportive community for readers who want to discuss books, life, and love. Members can look forward to getting to know the authors on a weekly rotating basis. Who are the other authors? *Squee* Virginia Kantra, Barbara Samuel/O’Neal, Sonali Dev, K.M. Jackson, Falguni Kothari, Sally Kilpatrick, Hope Ramsay, Donna Kauffman, Liz Talley, and Priscilla Oliveras. Of course, we will have weekly giveaways, occasional guest author posts, and more! As part of our launch, we’ve planned a big giveaway. On October 15th, one member will be selected to win a Kindle Fire, and three others will receive a nice Amazon gift card. Hope you’ll join us. You can request admission here!